COLUMBUS, Ohio, June 25, 2015 /3BL Media/ - American Electric Power’s 2014 Performance Summary, highlights the company’s financial, environmental, social and economic achievements. 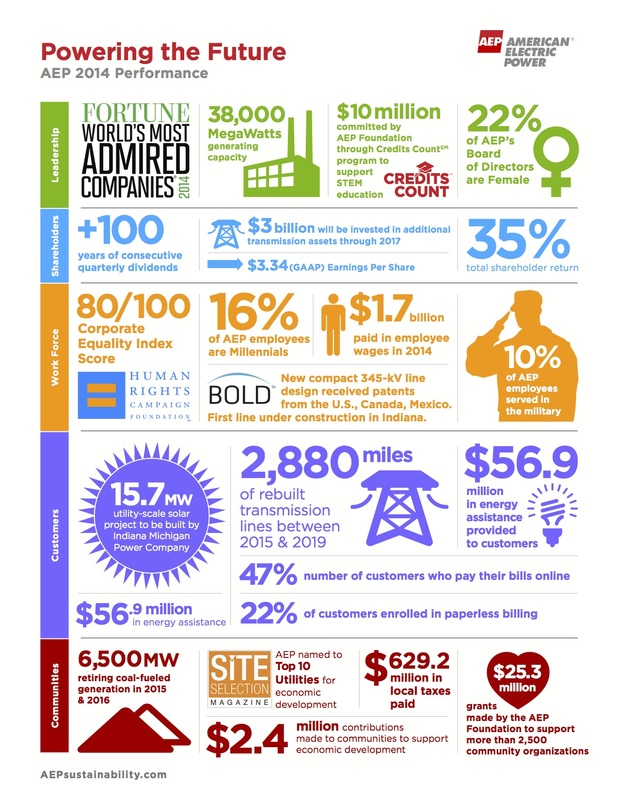 The summary infographic includes highlights from the company’s 2014 Corporate Accountability Report - “Powering the Future.” AEP’s strategy for growth includes continued diversification of our fuel mix, investment in transmission, technological advancements and improving the employee and customer experience. AEP retired approximately 5,600 megawatts (MW) of coal-fueled generation in 2015 and will retire another 998 MW in 2016. AEP has paid investors quarterly dividends for more than 100 consecutive years. The AEP Foundation has committed nearly $10 million over multiple years through the Credits CountSM program to support STEM education. Employee-led innovation includes a new, patented transmission line design called BOLDTM. Indiana Michigan Power Company received approval to build utility-scale solar projects totaling 15.7 MW. For more information, view the 2015 Corporate Accountability Report online or download the app in the iTunes store.